The Agrobrite Standing Plant Lamp offers exceptional illumination and versatility! 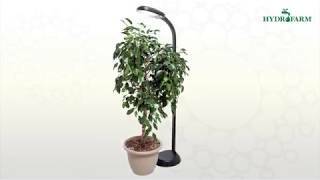 With a flexible neck and adjustable height (48" to 61") this lamp provides bright, natural light that will help plants thrive. Its flicker-free 27W compact fluorescent bulb provides unmatched clarity and color rendering, making this lamp ideal not only for plants but for reading as well.